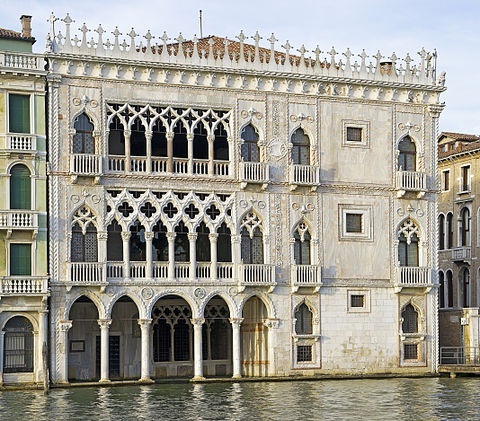 The Palazzo Santa Sofia was built between 1428-1430 for the Contarini family by father and son Giovanni and Bartolomeo Bon. It must have been astonishing in its day with its lavish gilt facade and painted polychrome decorations by French painter Zuan di Franza (hence its popular name, Ca D'Oro). In addition to the gilt and paint, the Istrian stone was touched up with white lead and oil to resemble marble, and the red Verona marble was oiled and varnished to emphasise its colour. Ca' D'Oro changed hands several times after the Fall of the Republic in 1797. During the period 1845-50, architect Giovanni Battista Meduna made dramatic alterations to the building for the dancer Maria Taglioni. These 'renovations' included the removal of the interior staircase and balconies. When John Ruskins saw Madame Taglioni's works he lamented: "I saw the beautiful slabs of red marble...dashed to pieces when I was last in Venice. Its glorious interior staircase, by far the most interesting Gothic monument of the kind in Venice, had been carried away, piece by piece, and sold for waste marble...". 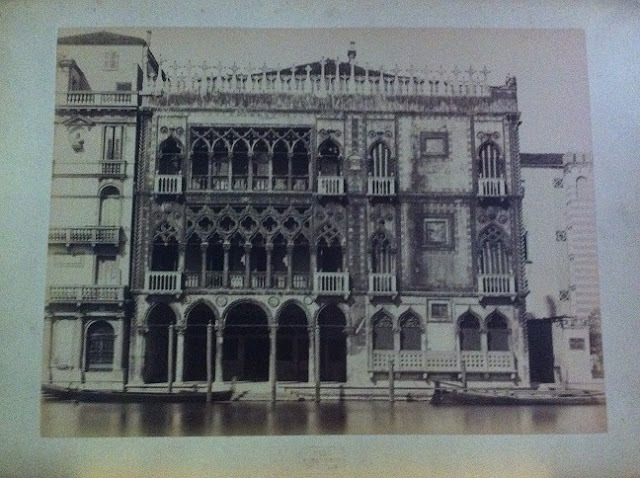 In 1894, Ca D'Oro was acquired and restored by Baron Giorgio Franchetti. He later bequeathed it to the State. Now a museum, Ca D'Oro still houses Baron Franchetti's collection. "Mon Palais "dasn une autre vie! Les Idees Heureuses: Je vous remercie de votre visite sur ce blog!